Preface. About the Editors. Contributors. Part I. Fundamentals of transformations and dynamics of trace elements. Contribution of rhizospheric processes to mineral weathering in forest soils (G.R. Gobran, M.-P. Turpault, F. Courchesne). Mineral weathering in the rhizosphere of forested soils (V. Séguin et al.). Characteristics of rhizosphere soil from natural and agricultural environments (G. Corti et al.). Metal complexation by phytosiderophores in the rhizosphere (S.M. Reichman, D.R. Parker). Effects of organic ligands on the adsorption of trace elements onto metal oxides and organo–mineral complexes (A. Violante et al.). Kinetics of cadmium desorption from iron oxides formed under the influence of citrate (C. Liu, P.M. Huang). Biogeochemistry of soil cadmium and the impact on terrestrial food chain contamination (G.S.R. Krishnamurti et al. ).Part II. Speciation, bioavailability, and phytotoxicity of trace elements. 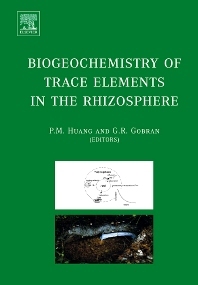 Speciation and bioavailability of trace metals (Cd, Cu, Ni, Pb, Zn) in the rhizosphere of contaminated soils (P. Legrand et al.). Influence of willow (Salix viminalis L.) roots on soil metal chemistry: Effects of clones with varying metal uptake potential (M. Greger). Fractionation and bioavailability of copper, cadmium and lead in rhizosphere soil (S. Tao et al.). Bioavailability and extractability of copper and zinc in a soil amended with pig slurry: Effect of iron deficiency in the rhizosphere of two grasses (S. Thomas et al.). Binding and electrostatic attraction of trace elements to plant root surfaces (U. Yermiyahu, T.B. Kinraide). Model development for simulating the bioavailability of Ni to the hyperaccumulator Thlaspi goesingense (A. Schnepf et al.). Effect of arbuscular mycorrhizal (AM) fungi on heavy metal and radionuclide transfer to plants (C. Leyval). Uptake and translocation of uranium by arbuscular mycorrhizal fungi under monoxenic culture conditions (G. Rufyikiri, Y. Thiry, S. Declerck). Index.